Just like London, the best way to get around New York is by the subway. There’s a station everywhere you look, so getting around NYC is fairly straightforward. As it’s such a big city it has a very good transport system. However, if you are feeling lazy you can always grab a cab. Most tourists like to walk around New York as much as possible, as this is the best way to make sure you see every detail of this unforgettable city. You can also get a hop-on-hop-off bus pass from one of the many sales staff on the streets. Do the uptown and the downtown loop – ride them both all the way round Go on a ‘harbour cruise’ for picturesque views of the skyline, Brooklyn bridge and statue of liberty. There’s also a free Staten Island ferry you can get (a big orange boat) that also shows you the Statue of Liberty. 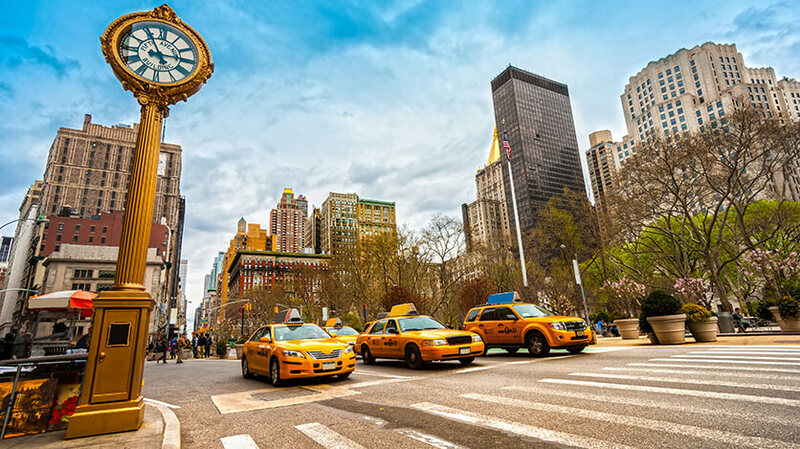 You can rent a car in New York but navigating around the city isn’t easy, especially if you haven’t been before. New York has three airports to choose from, La Guardia (LGA) in the Queens borough of NYC, Newark (EWR) across the river from Manhattan in New Jersey and JFK which is about 12 miles southeast of Lower Manhattan.